After we took down the huge open cabinet above our toilet in our powder room, I loved the openness, but I also knew I wanted a little something to go above the toilet to distract from it. 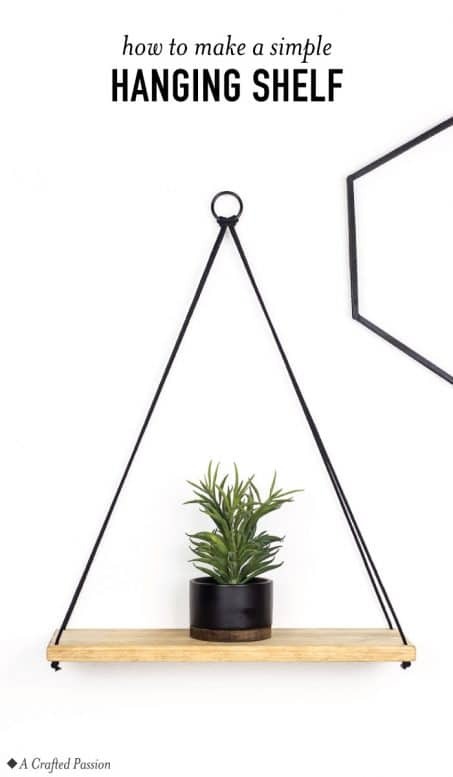 I thought a simple hanging shelf would be the perfect simple DIY to add. This project took barely any time at all and looks great. 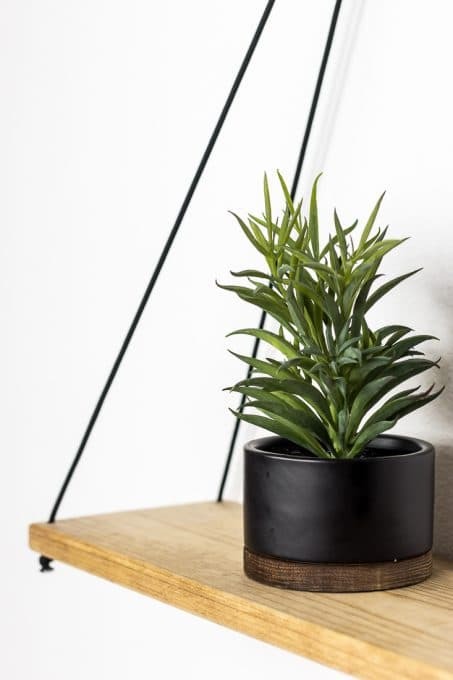 This shelf is so versatile, you can use it for any room in the house. 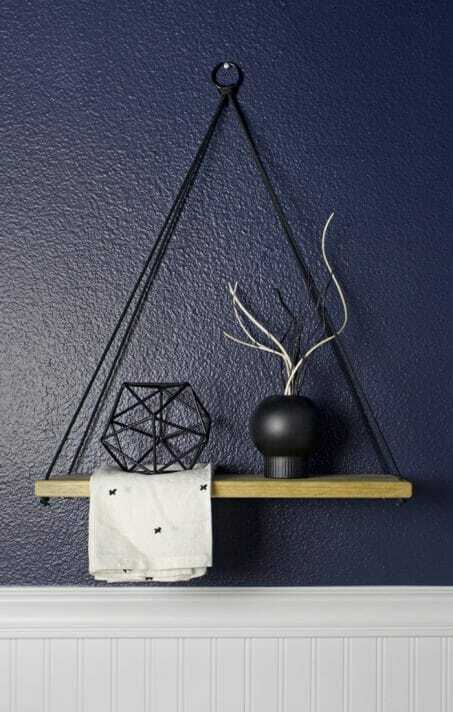 Let me show you how to make your own hanging shelf. First, cut your board to size. I wanted to make sure ours didn’t stick out further than the toilet tank and was about the same width across since it was going to be centered right above the toilet. 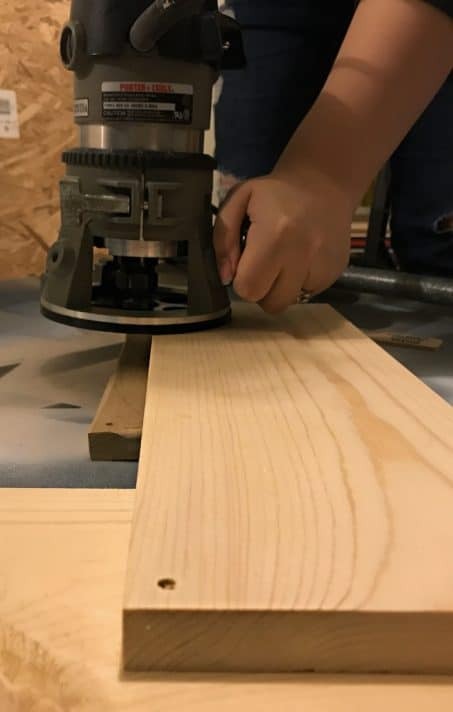 Once you have your board cut to size, draw a line 1/2” away from each edge and make a mark where the two lines intersect. Drill a hole in this intersection with a bit that is just a little bit larger than your paracord and drill straight through your board in each corner. Next, sand your board smooth, especially where you just drilled holes. Now, take your router and round all the edges if you wish. I used a 1/4” roundover bit. 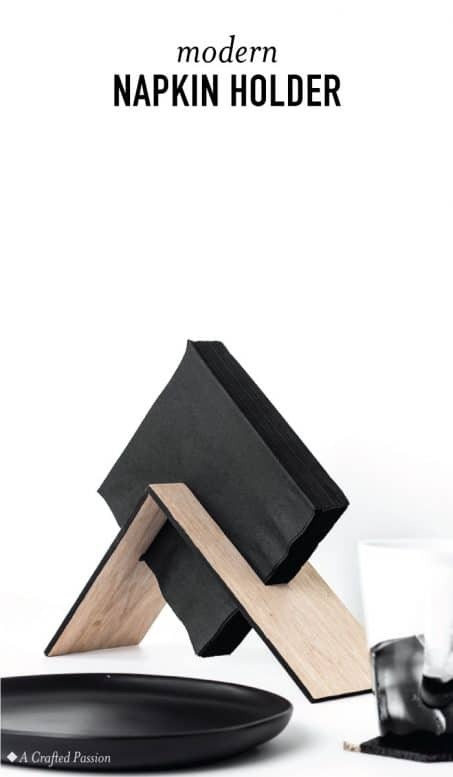 You can leave this step out if you’d rather keep the square edges. Make sure when buying new bits that you get the same size shank that your router takes. My Porter-Cable router takes both 1/4″ and 1/2″ shank bits. If you wish to stain your board or paint it, now’s the time to do that. 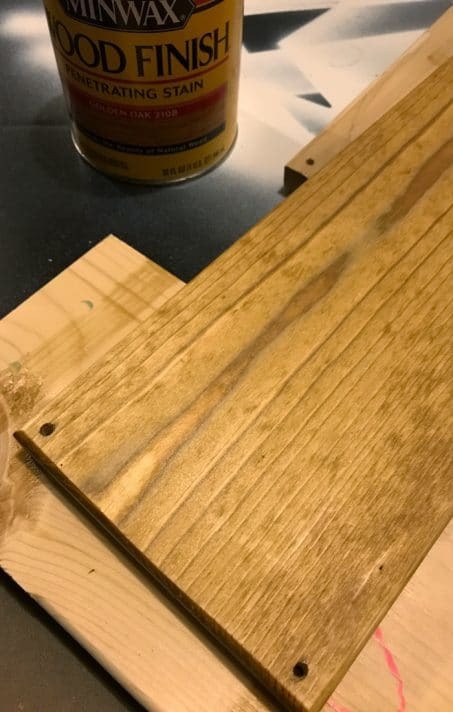 I did one coat of golden oak stain and wiped it dry after about 15 seconds. It helped bring just a little bit of warmth to our dark powder room. 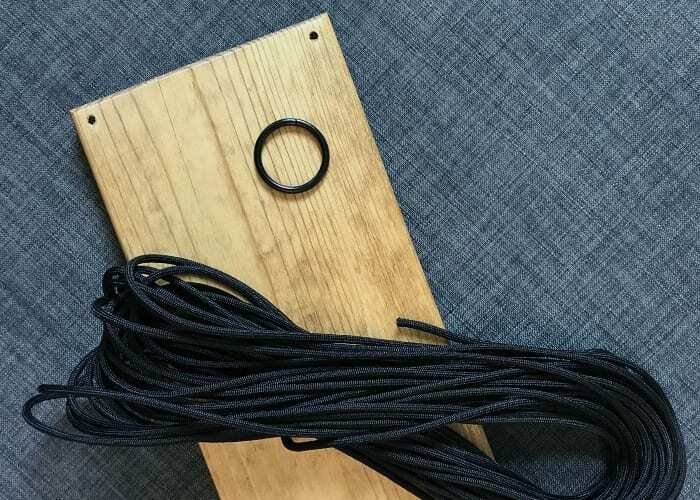 Next, take your paracord and cut two pieces that are more than 2.5x the height you want your hanging shelf. For example, say you want your shelf hanging 20” below the screw, cut two lengths of paracord at least 50” long. Take these two lengths of cord in one hand and fold them in half. 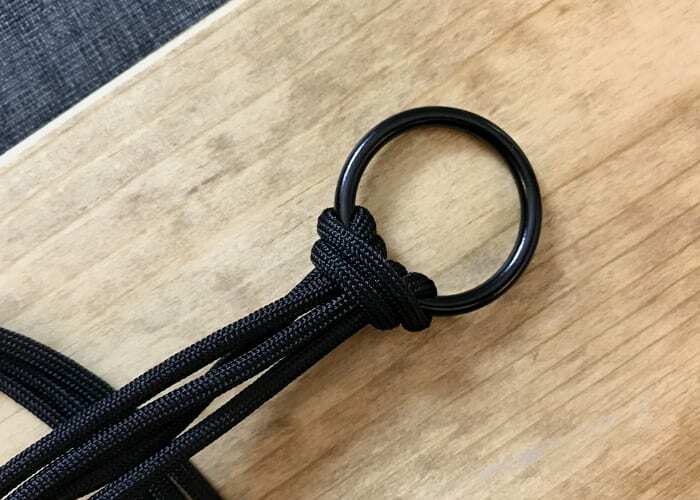 Take folded end and feed through the ring and then pull the loose ends through the folded end so it creates a knot around the ring. 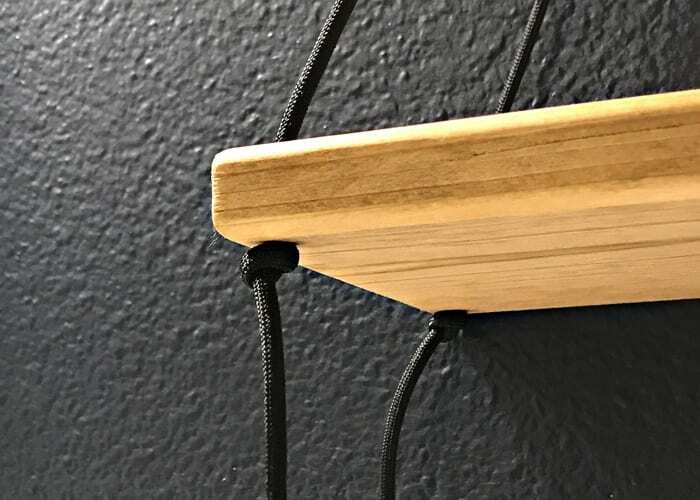 Now, feed the string closest to the front of the board through the holes on the front of your shelf and tie a loose knot so they don’t accidentally pull through. Repeat with the back holes and other string. I’m sure there’s an accurate calculation to give you the exact measurements of length of cord and height of shelf to know where you should tie your knots, but I just went by eye and think it turned out great. Screw a drywall screw into your wall and hang your shelf from it. 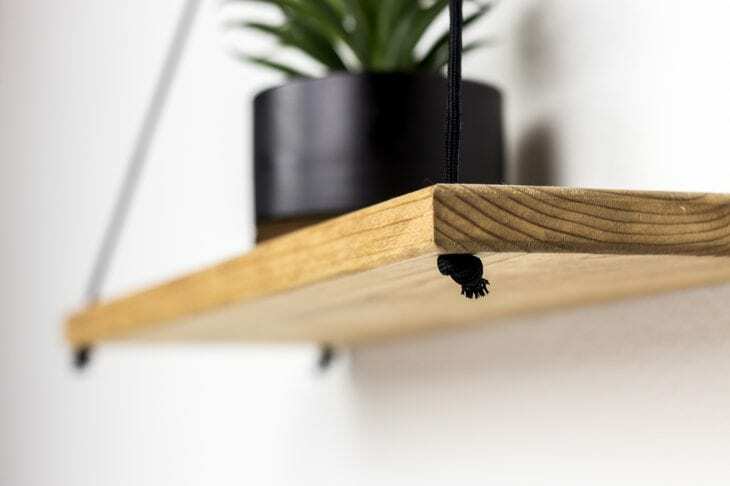 Now, adjust your knots until your shelf sits level. 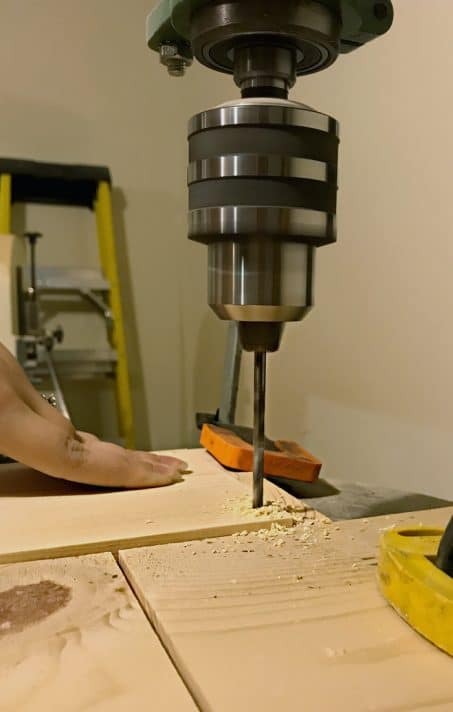 This small level is super handy to have around and a necessity when it comes to home projects. Once you get your shelf level you should cut the end of your strings off, and you’re done! I was a little concerned our shelf might get bumped and fall or get knocked off-center, but our hanging shelf has been up for almost 5 months with no issues and hasn’t even been bumped by tiny humans. 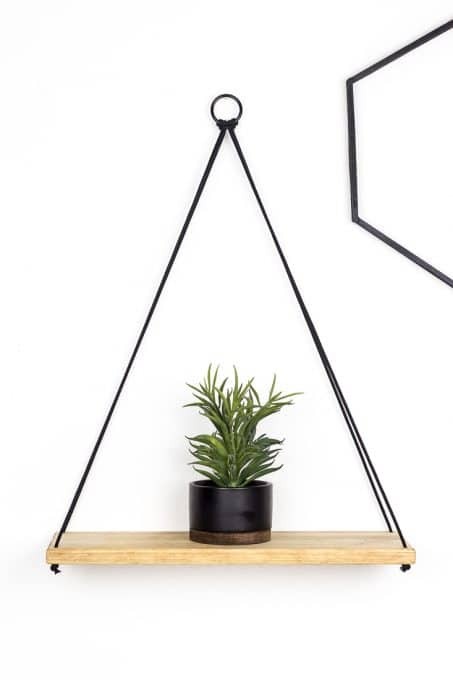 Where would you put a hanging shelf? Here’s how the shelf looks in our dark powder room we made over last fall. 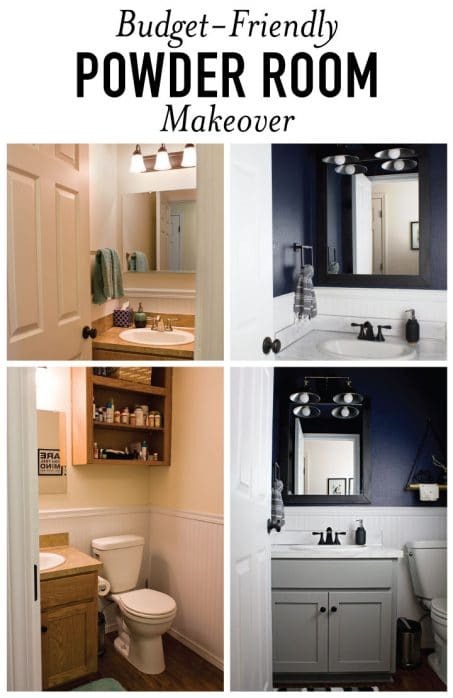 This moody and dark bathroom makeover reveal is STUNNING! Between the navy wall color, updated mirror, faux countertops, and matte black accessories, this whole small powder room turned out amazing.